Whether your senior has specific needs for care right now or not, you might want to consider enlisting senior care providers for companion care. 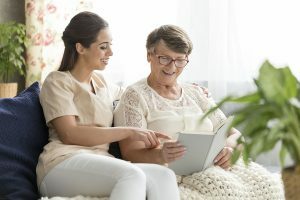 This is a type of care that focuses on being there in an emotionally supportive manner for your senior while also handling other tasks as necessary. Running errands can be even more difficult for your senior than you might think. It takes a lot of energy and effort to go to various stores and to do what she needs to do in those locations. Having someone else who can make sure that she’s safe and that she’s doing what she needs to do. This allows your elderly family member to have help but also to have control over her errands. Transportation can be a huge need for your elderly family member. When you meet that need with a friendly companion you’re giving your senior multiple benefits all at once. She doesn’t have to feel as if she’s stuck within her own four walls because she’s got help to get wherever she wants to go. Keeping your elderly family member’s brain active is vital and one of the easiest ways to do this is with games and puzzles. Many of these tools aren’t all that entertaining when it’s just your senior, though. Having senior care providers around who are willing and able to play a hand or two of a favorite card game is welcome. Keeping up with some regular daily activities, like the constant influx of mail, can be a lot for your senior. Not only that, so much of the scams that older adults receive in the mail are designed to look as if they’re legitimate and important. Having someone else there to sort mail and get rid of obvious junk mail can be a relief. But don’t underestimate the impact of friendly conversation. If your elderly family member doesn’t get out much, she may not have many opportunities to talk with other people. Having friendly home care providers available for daily conversation about whatever comes up can be comforting for her. This is also a great way for you to stay informed about what’s going on with your senior because elder care providers can update you regularly. Just having someone else available during the day can make a huge difference for your aging family member. Senior care providers can be that daily companion for your elderly family member and meet her needs wherever they are. On those days when she’s not feeling up to going out and about, she’s still got a friendly face there with her.